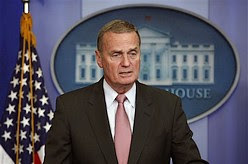 NSA Chief James Jones Repeats the Obama Line: Two State Solution Will Solve Iranian Problem……. – The Tundra Tabloids……. NSA Chief James Jones Repeats the Obama Line: Two State Solution Will Solve Iranian Problem……. Breathtaking. This is like a clueless adult leaving a troublesome underage kid alone in the house with enough matches and kerosene to blow everything up and taking the neighborhood with him, all in the name expediency. It’s a classic case of placing the cart before the horse. It will take years, if not decades for the Palestinians to return to some sense of normality that will enable them to value the building a decent state for themselves more, than destroying the Jewish one that already exists. How do JINO’s (Jews in name only) Reconcile their Betrayal? In an interview with ABC television, Jones said that the US government agrees with Jerusalem that Teheran’s nuclear ambitions pose an “existential threat” to Israel. “We understand Israel’s preoccupation with Iran as an existential threat. We agree with that,” the senior official was quoted as saying by AFP. However, Jones went on to stress that the Iranian threat only reinforces the need for peace in the region. By the same token, there are a lot of things that you can do to diminish that existential threat by working hard towards achieving a two-state solution,” he reportedly said. “This is a very strategic issue. It’s extremely important. And we’re looking forward to having a good, constructive dialogue with our Israeli friends when they visit Washington in the next seven or eight days,” Jones said in response to a question about Prime Minister Binyamin Netanyahu’s upcoming visit to Washington on May 18. In a closed meeting with AIPAC’s major donors last week, Obama’s chief of staff, Rahm Emmanuel, reportedly said that America’s ability to face Iran depended on Israel’s ability to make progress with the Palestinians. He also reportedly told them that solving the conflict would enable progress in dealing with the main threat of Iran. However, senior Israeli officials have rejected linking the Iranian nuclear issue with the Middle East peace process. Previous Post Previous Post Filip Dewinter’s speech in Köln……. Next Post Next Post Pamela Geller: Mission Accomplished……?